Despite the fact that both Miltonia and Miltoniopsis orchids are sometimes called Pansy Orchids, only a few of Miltionia species (for instance, Miltonia spectabilis) actually look similar to them. Most Miltonias resemble their close relatives – Oncidiums. Unlike Miltonia, Miltoniopsis orchids have bigger pseudobulbs, which are two-leaved on apex (unlike smaller single-leaved pseudobulbs of Miltoniopsis orchids), and grow in different ecological conditions – while Miltoniopsis orchids are cool cloudforests dwellers, Miltonias usually grow in tropical rainforests in nature, hence the differences in growing conditions between Miltoniopsis and Miltonia orchids. There is also much confusion in that Miltoniopsis Pansy Orchids are often sold as Miltonia orchids, and often only experienced orchid growers can notice the difference. Miltonia orchids are sympodial epiphytes from rainforests of Brazil and Argentina. They have profound elongated pseudobulbs with two leaves on top of them. Unlike Miltoniopsis orchids, they are light green in color without glaucous shades. There are 20 or 21 currently recognized species in this genus. 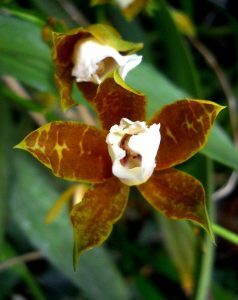 Some species, which were included to this genus before, not long ago were moved to different genera of Oncidinae Alliance – Brassia, Cyrtochilum, Odontoglossum and Oncidium. Flowers of Miltonia orchids usually are waxy, unlike more tender flowers of Miltoniopsis orchids. Miltonia spectabilis – the type species of this genus – has pansy-like 4 inch wide whitish flowers with purple lips. There is also beautiful alba form Miltonia spectabilis var alba with snow white flowers. Despite the name, meaning “snow white”, Miltonia candida’s 3 inch wide flowers are brown white whitish lips. And Miltonia regnellii has lovely 2 to 3 inch wide pinkish flowers. Miltonia x Bluntii is a natural hybrid with nice 3 inch wide pansy-like fragrant flowers. 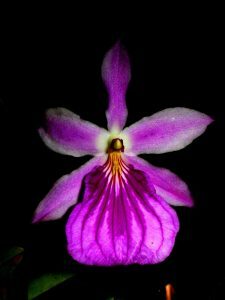 Given the fact that Miltonia orchids grow in tropical rainforests areas unlike Miltoniopsis, which dwell in cool cloudforests, they are much easier to grow than Miltoniopsis Pansy Orchids. In fact, they are more similar in culture to Oncidiums (which are close relatives to Miltonia orchids, and even some botanists combine them into one single genus). If you grow Miltonia, the light should be brighter than for Miltoniopsis orchids – they need a bright filtered light with some sun in the morning. Temperatures should be intermediate to hot – so they are much more suited for common indoor conditions of conventional living rooms than strictly intermediate Miltoniopsis. The substrate should be more epiphytic, comprising from medium bark with some sphagnum and cocoa chips, but you might grow them in a pure medium bark. Watering should be regular with some drying between watering (their roots are much more tolerable to dry than the ones of Miltoniopsis orchids), air could be of average dryness, but humid air with strong air movement is better for them. When actively growing, they become heavy feeders and need regular fertilizing.